Okay, so the title of this blog post is rather cryptic, but that’s because I want to quickly talk about three different things. Twittering BNC. Brook v Plimer report back. 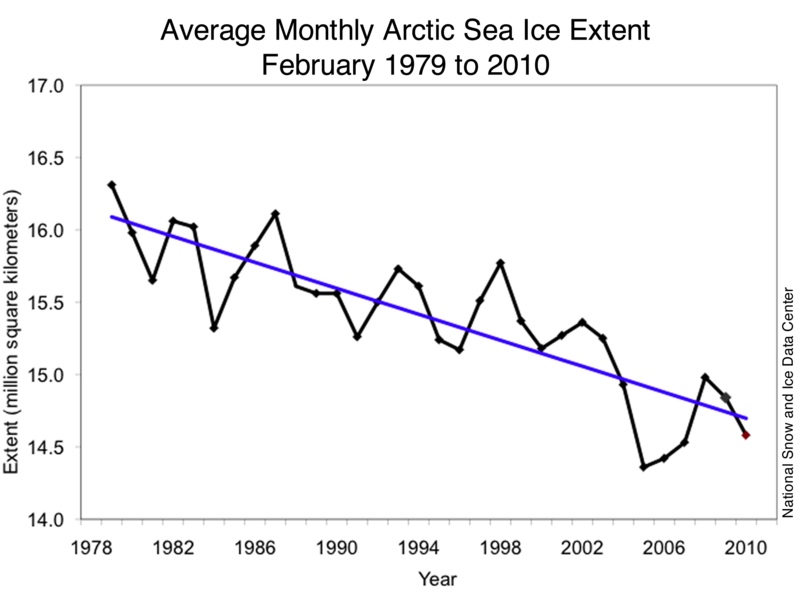 And the famous disappearing Arctic sea ice. First then, BraveNewClimate is now producing tweets. You can start following here: http://twitter.com/BraveNewClimate. I’ve also fed the latest 5 tweets on the right sidebar of the BNC blog, below the recent comments list. I’ll use this to feed snippets of interesting information or news that I’ve come across, which relates to the theme of BNC (climate change science and impacts, and sustainable energy for the world), as well as sending out announcements of new blog entries. Feel free to become a Twitter BNC follower, if this part of Web 2.0 takes your fancy. Second, a brief reflection on that debate with Ian Plimer. It was an interesting night out, which I mostly enjoyed, though it admittedly did fell a bit like a Circus act. The audience turnout was certainly fantastic — a small hall in North Adelaide was packed to the hilt, which made for a great atmosphere. Ian Henschke from ABC Stateline made for a good, fair moderator. I focused initially on communicating the methods of science and how many small elements come together in a vast body of knowledge that is the science of climate change and its impacts. Plimer then spoke for 10 minutes on the need to consider time (I’d pre-empted him on this), and stated that climate is ‘always changing’ and that the theory that carbon dioxide is causing current change, or has ever caused it, has been falsified. I’ve addressed why this is not the case many times before, and in my rebuttal I made mostly the same points again. The question and answer session that followed was fairly routine, except for a rather dramatic ‘moment’ involving a poorly phrased audience question that invoked a sharp retort from my opponent (you had to be there), and some less-than-gentle prodding of Ian by me in order to extract a clear on the question of water vapour’s contribution to the greenhouse effect — which resulted in Ian demanding intervention from the moderator. I’ll leave it to the audience to judge who was in the right. Perhaps some folks who were at the debate can provide their own perspective in the comments below — I know Geoff Russell and ‘John Smith’ already have, in the previous thread. The end result? An entertaining enough night out, but I doubt anyone changed their minds (a show of hands near the end backs up this hunch). Alas, although The Environment Institute gave me an .MP3 mic to use to record the debate, the technology failed (I swear I pressed the right button) and so there is no podcast available. I do know that ABC Lateline TV filmed the first hour (I’m not sure if they intend to broadcast anything, or whether it was just for the archives), so there may yet be some hope of us getting a copy of that (we’re looking into it). I’ll report back here if anything eventuates on that front. Still, as a teaser of more information to come, I’m very pleased to say that a colleague of mine (a well-respected US-based climatologist whose name will is probably familiar to some [many?] of you) was in the audience on Tuesday, and made plenty of notes whilst listening to Ian Plimer’s claims. He is currently preparing a write-up of his major critiques, and I’m happy to say that these will be published on BNC within the next week or so (after he’s finished writing this up). Stay tuned! 1. February 2009 — the point of the year when Arctic sea ice is at its maximum extent — witnessed a record low amount of [winter] ice, and the extent of re-freezing was dramatically less than the median year. 2. Arctic sea ice continues to thin, leaving about 70% of Arctic ice — up from 40% 30 years ago — as one-year-old ice susceptible to summer melting… ice older than two years now accounts for less than 10 percent of the ice cover. The 2009 summer ice melt is currently at its second lowest level on record for the end of July. The figure to the right clearly illustrates the melt pattern over the last few years — it is prepared by Philip Sutton of Greenleap (click on the chart to jump to the page, which includes a fuller explanation and a slew of other relevant figures). Brian at Larvatus Prodeo also has a nice article on this. For a technical analysis from the guys at NSIDC, click here. Now, bear in mind that although 2008 was only the 2nd lowest melt extent on record (bested by 2007), it worringly DID represent the lowest ice volume ever. Each year, the average ice thickness across the North declines, thereby priming subsequent seasons for greater and greater losses. With ‘favourable’ wind conditions, the thin veneer of ice is more readily broken up by storms. More dark water is exposed, aborbing rather then reflecting back the sun’s energy. The amplifying feedback of this climate tipping point becomes ever more inexorable. This is definitely a climate metric to keep watching in the next few months, as the late September melt maximum is approached. Barry: you may be amused by The 10 Most-Respected Global Warming Skeptics”. Guess who gets front-page billing (although only #7 in the list)? I did attend the session and did not enjoy some of the arguments and the way they were presented. Ian Plimer’s style is to use a series of bits of arguments to disprove the anthropogenic climate change as a hypothesis, and then to climate change must always be due to something else. There were silly suggestions such as asserting that climate models cannot predict past volcanic events and past El Nino cycles etc., that actually occurred. Barry answered this by suggesting that the models predict the frequency and nature of such cycles, but not an exact point in time as to when these would occur. In the same way, I don’t know if February 4th next year will be raining or sunny, but I can be prety sure that we are likely to have more hotter sunny days in February than we experience in July. There were many other partial facts which seemed to be presented as factual global events and I have read many line by line responses to such arguments. The question that Ian Plimer did not answer and will not answer as far as I can tell is, ‘at what point?’ will he consider that there is enough evidence to support a global risk management response to the problem of climate change. We are all in violent agreement that climate changes, has always changed and will always change. The IPCC suggests that the human cause can add onto and trigger stepped changes that may result in 2 degrees warming to over six degrees by the end of the century and with such change our home won’t be a pretty picture for human settlements and current ecosystems. I can only assume that Ian Plimer would not change his view even if the planet is tripped into global warming of 3 degrees by 2050. The same arguments and the disregard for the work of many climate scientists can still prevail. I really do hope that Ian Plimer is right and the buffering features of the planet will soften the impact of positive feedback loops, but this is hope and not science. I am puzzled by Ian Plimer’s approach that human forcing cannot have an impact when he acknowledges that many other forces frequently change climate. For insight, my reading of his logic is that volcanoes release such large volumes of carbon dioxide that the human signature is trivial in comparison. Whilst I am sure that in geological time this is true, I would be keen to again see the context (and numbers) of human greenhouse emissions against volcanic emissions over the last 4 million years (Barry or someone?). As a policy officer (not a climate scientist) my decisions will be based on the IPCC advice, and assessments of how humans are behaving in terms of their emissions. I am happy to adjust my role in managing risks as the science is updated. So what does it take to motivate others to manage the risk? Would it be a current IPCC Assessment report?, 1 further degree of change?, 3 degrees change?, 6 degrees change with no new climate forcing agent identified?, 1-2 metres of sea level rise? My kids are being placed in a planet that is a bit like an airplane to the future. Planes crash every so often but in this case, the Climate Scientists are advising that the plane is not airworthy. Just because planes have crashed in the past, it does not mean that safety is not important now. Thanks for the update Barry. Shame about the portable .mp3 recorder (the User Interface on most of those devices is appaling – been known to record exactly nothing myself!). Thanks for trying to get us some audio, for the photo and your narrative on the ‘dramatic moment’ – gives those of us who couldnt be there a sense of what went on. Anyone want to offer odds against that this year it may be possible to sail around Arctic inside 70o N. This means essentially that the northern coast of Greenland will clear. After that it’s all downhill. So through our global warming experiment we should discover what 130 times the current background levels will do to the planet as the century rolls along. Here is a brave near-term climate prediction. You have to admire the authors for putting their proverbials on the chopping block so precisely as this. Unfortunately I don’t have easy access behind the GRL paywall these days; I’d be interested in the comments of anyone who does on Lean and Rind’s methodology. It is now March,2010. The arctic sea ice extent seems to be continuing to recover, both the winter maximum and summer/fall minimum. At what point will you consider that this danger is past(for the foreseeable future)?